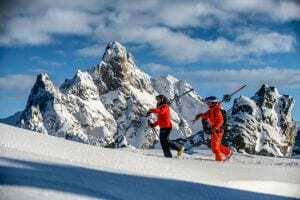 Serre Chevalier is one of France’s largest ski resorts with 250km of pistes and some of the best tree-skiing in the French Alps – an abundance of widely-spaced larch trees have a lot to do with this. 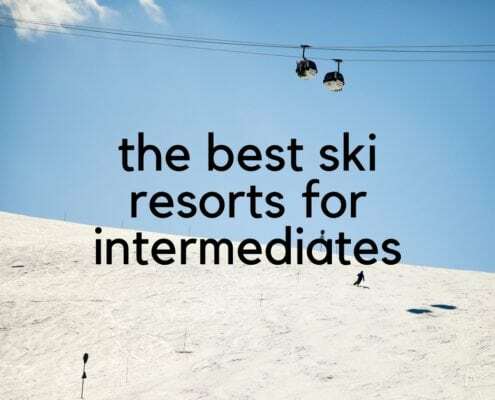 Amazingly, the resort remains relatively undiscovered, so you can expect quiet pistes even in peak weeks, great value for money and southern alpine sunshine. Serre Chevalier spans between the medieval town of Briançon at 1200m and the alpine spa village of Le Monêtier les Bains at 1500m. 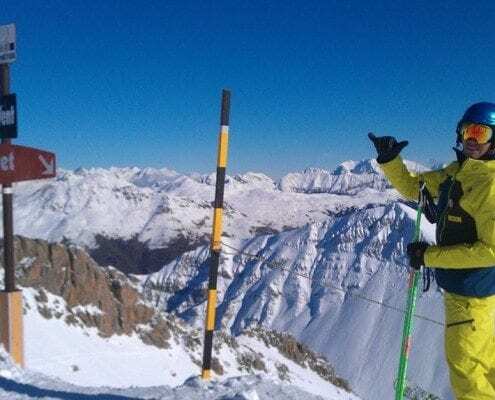 The highest lift accesses pistes and off-piste itinerary routes from 2830m altitude, and the off-piste mecca La Grave La Meije is just a 25 minute drive away. Find the lesson that suits you in our Serre Chevalier Ski School. One of our favourite place to ski in Serre Chevalier. It has it all. Nursery runs at village height for children and adults, thoughtfully laid out and with recent equipment and a restaurant just a stone’s throw away. Intermediate runs adorn mid-station around 2000 metres altitude, such as L’Eychauda, Aya and Corvaria. 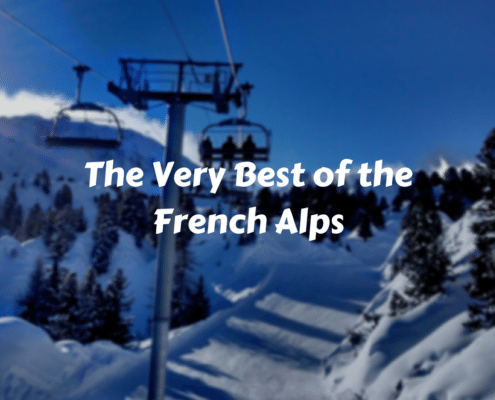 Then the off-piste potential takes in the finest larch forest in the Alps – you will never forget skiing La Montagnolle, Tête du Grand Pré, Lauzières and more. Entertain the more proficient skiers in your party and those who think the ‘park’ is somewhere worth hanging out all day long! Located at the lower end, albeit still at 1200 metres altitude at the bottom. Its predominantly sunny cruisey blues and reds – a must is the ‘piste Vauban’ – descend into the thriving new town. You have the most magnificent views of historic forts perched above the town from almost every piste. Serre Chevalier is just 1.5hrs from Turin airport, 2hrs from Grenoble, and is only 35 minutes drive from the TGV train station at Oulx (Italy), direct from Paris. You can drive from one of the northern ferry ports in 10 hours. Local firms offer airport transfers e.g. The Alpine Transfer Company and Resalp – LinkBus. Great value catered chalet and hotel packages, Monêtier. Their Chalet Charlotte was completely renovated in 2013. Gavin visits the chalet at ski tea Sun-Tue. Ski deals and cheap holidays with the biggest tour operators in Serre Chevalier. – Monêtier: www.wiiski.com – lovely rental and coffee shop! There’s no better way to find out than checking Serre Chevalier’s web cams, just click here. And have a look at the live lift and snow depth info here and here. You’ve picked a fabulous resort for skiing – and a fabulous resort to keep your non-skiers happy too! At the lower end of Serre Chevalier, enjoy BRIANCON and it’s fortified town – the Cité Vauban. Cobbled streets steeped in history, cafés (must stop: Café Turin), art galleries, tourist office, restaurants all overlooked by the Croix de Toulouse and the peaks that surround this alpine town. The highest end of Serre Chevalier (LE MONETIER LES BAINS) boasts one of Europe’s largest thermal baths Les Grands Bains. Indoor and outdoor steaming pools, jets, plunge pools of differing temps, sauna, waterfall, … A must for skiers and non-skiers alike. Because Serre Chevalier is a working valley, with farms and all-round businesses and it’s main town of Briançon, you will find everything you would expect to keep the locals and holidaymakers happy: theatre, cinemas, ice-rinks, no less than three large swimming centres, free bus service (with guest card), historic tours and all the usual winter activities such as snow-shoeing and dog-sledding. Le Bistrot de la Paix * – great menu and desserts! Le Rustique * – home to Briançon’s own tasty fondue! Mamma Mia * – genuine Italian, fast service, sometimes a bit erratic but great value! How do I get around resort? Serre Chevalier has a dedicated Ski Bus that serves the whole valley using the main valley road (Route Nationale). NOTE: From winter 2017/18 this service is payable when boarding and we are awaiting exact tarifs; expect 2€pp for each journey or 4€pp for a day bus ticket. If you’re looking to simply get from and to your accommodation to the nearest lift (in your sector e.g. staying in the village of MONETIER LES BAINS and want to get to the BACHAS chair lift), use the local buses (or Le Petit Train in Villeneuve. These services are FREE with your lift pass or guest card (for non-skiers). Each lift station in Serre Chevalier has a childcare centre, whether it is a local creche or an ESF-run ‘garderie’. There are very few childcare options other than these so we’ve ensured that our friends at independent travel company EurekaSKI will advise you on the most suitable option for your child/ren based on where you’re staying. From time to time they have a nanny service, so get in touch quick!